Digital Camo Mini MagLite® and Dakota knife with your Corporate Logo! 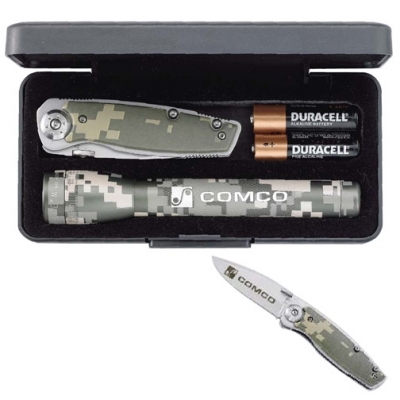 Digital Camo gift set includes Mag-Lite, Dakota knife, two AA batteries, and a quality gift box. A great combo set that features the hot new Digital Camoulfage Design. The Mag-Lite is 5 3/4" long. The Dakota® knife has a 3 3/4" handle and 2 1/2" blade. Comes with 2 “AA” batteries and packaged in a beautiful presentation box. Price includes laser engraving on both items.